Home > Things YOUR Beards Can Lift	> The Double Crossers Fight Rats with Beards! The Double Crossers Fight Rats with Beards! We’ve seen some incredible beards so far, but this one takes the cake. 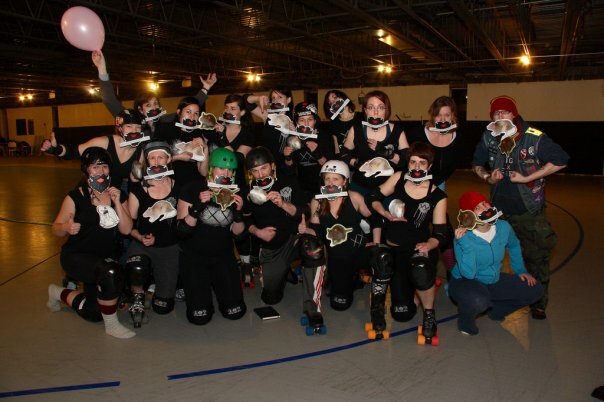 It’s the Windy City Rollers’ own Double Crossers lifting RATS with their BEARDS! Best of all, they just raised $17 for Off the Street Club with just scissors and floss! You can too! Download a beard and some heavy things. Cut out the beard, hang some things off of it, and take a picture. Upload your picture to the Facebook Group. I’ll keep donating until we have 1,000 big, bushy, beautiful beards! Join in the ridiculousness today! I forgot to mention that WCR refs Dr. Vroom and Oedipus Ref are also in there rocking beards. Hooray! I’ve never seen a more beautiful image of bearded women! And I should know! Did anyone notice that Oedipus’s rat ate his beard and hung out on his face in its stead? Haha!! Lift 4 will be 31 pounds! The Beard in Time Out Chicago!